Perspectivity cordially invites all game players to join the upcoming Train-the-Trainer session to learn how to facilitate the Stress Nexus! Challenge and the Public Health Challenge. Do you recall the last Perspectivity Challenge you played? Do you remember the fun you had or the things you learned? Or maybe the turbulence or the feeling of confusion? 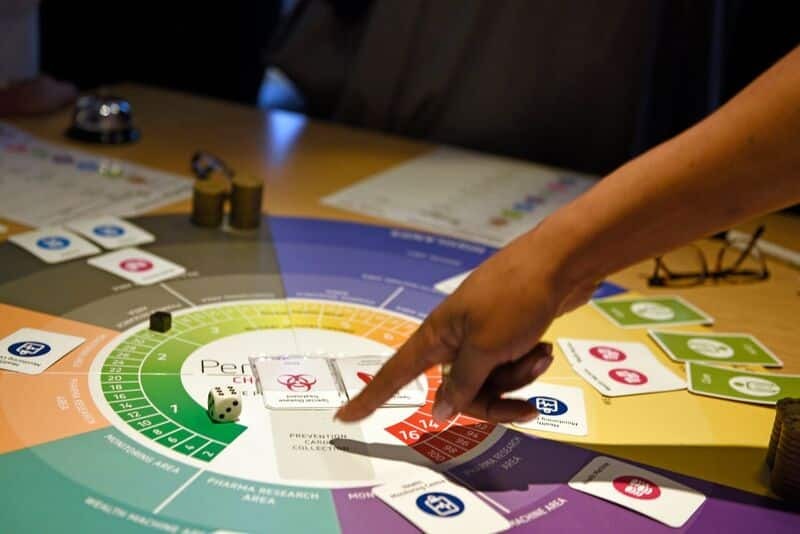 You can now become a Perspectivity game leader yourself and contribute to the learning experience of others! Will you join our game leader pool? On Friday the 9th of March, there will a Train-the-Trainer session for aspiring game facilitators. During this training, you learn how to lead the challenge, from starting the introduction to guiding the dialogue-laden debrief. The training is designed to make you (more) aware of the concepts behind the challenges and to enhance your understanding of facilitating a reflective dialogue when the game is over. The training will be given by Herman van der Meyden, Apostolos Georgiadis and Hanne Verhoeven. After the training, you are part of the Perspectivity challenge facilitators pool, which means that you’ll be able to host Perspectivity challenge sessions and can contribute to the learning experience of others! Perspectivity has played the challenges in very different business and public sector settings – to become inspired, see here. Challenge facilitators do receive a stipend for hosting a challenge. We serve some pizza during the break! Main language: the plenary part will be in English. The Nexus training is in English, the Public Health training is English or Dutch given the preferences of the game table. Play a mini-session of the Stress Nexus! challenge or Public Health challenge to refresh the memory of your gaming experience. Or play a mini-session to come to know the challenge if you are acquainted with other Perspectivity challenges but not Nexus or Public Health specifically. The training teaches the skills to lead the Nexus or Public Health challenge, by facilitating the introduction and explanation of game rules; the actual gaming; and the debrief of the game. The training dives deeper into the game dynamics and concepts; enhances understanding on dialogue-enhancing processes; and explores the options of using one of the challenges in your own (professional) context.